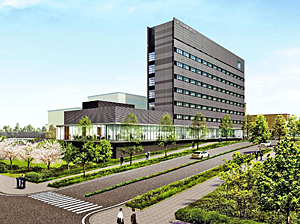 Some facilities of the J-Village training center, which is currently being reconstructed, will resume operations on July 28, the company operating J-Village has officially announced. J-Village straddles the towns of Naraha and Hirono, both in Fukushima Prefecture. In addition to hosting soccer-related events, such as the national soccer team's training camp ahead of the 2020 Tokyo Olympics, the operating company plans to use the facilities for other sports, such as rugby, as well as drone racing and concerts. Operations of facilities including some of the natural turf pitches, a new accommodation building and a center building will be resumed ahead of other facilities. The new accommodation building will have 200 guest rooms, nearly twice as many as the former accommodation facility. A convention hall with a capacity of about 300 people also will become available. The operating company will begin accepting reservations for these facilities from April 1. After the 2011 Great East Japan Earthquake and the accident at Tokyo Electric Power Company Holdings, Inc.'s Fukushima No. 1 nuclear power plant, J-Village was used as TEPCO's operational base for the decommissioning of the plant. However, before the disaster, J-Village had been used for training camps for the national team and J-League teams as well as for soccer events for children. After partially resuming operations, the Fukushima prefectural government aims to fully resume operations in April next year by pushing forward construction of an all-weather practice field, a stadium and other facilities. In addition, the prefectural government will strengthen measures to promote the use of J-Village, which had been visited by about 500,000 people each year before the disaster. Meanwhile, in line with the full resumption of operations of J-Village, there is a plan to build a new train station on the JR Joban Line between Hirono Station in Hirono and Kido Station in Naraha. With an eye on the plan, the prefectural government will consider using the facilities for purposes other than sports events. Eiji Ueda, vice president of J-Village, and Shunsuke Ono, executive director of the company, held a press conference at the prefectural government building and announced the date when they planned to resume operations. "J-Village finally will resume operations about seven years and four months after the disaster. We would like to make efforts to make it a symbol of reconstruction of Fukushima by turning it into a base where many people gather together and interact with each other through the power of sports," Ueda said. In addition, Fukushima Gov. Masao Uchibori expressed a feeling of hope at a regular press conference. "J-Village is equipped with attractive facilities such as an all-weather practice field and a new accommodation building. I hope it will make a great contribution not only to promoting sports but also to increasing the number of people communicating through sports and dispelling unfounded concerns as a new core facility for the region," he said.